It’s still a little warm in Kansas City, but it’s starting to feel like Fall is here! I took my kids to the Renaissance Festival today and it was crazy! So many interesting people in elaborate costumes. It was so nice being outside, too! I have an eclectic mix of favorites this week. From hydrating lip glosses with light-up lids, to a makeup bag that is perfect for travel to shampoo and body lotion that work well for sensitive skin. 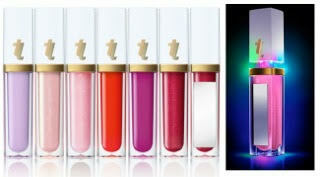 True Lipz “Flash” collection ($18.95) At the push of a button, the unique multi-color, flashing LED strobe light and convenient mirror ensure the perfect pout even in the dark. The glam shades glide on super-smooth with a rich texture and brilliant sheen. You can pump up the volume with high voltage color that pops, or tone it down with a gentle wash of color that leaves a whisper-soft shine. Also available is the When it comes to color, the True Lipz “Lustre” collection. Glistening, on trend stay-true shades glide on smoothly, depositing the ideal amount of saturated color and a rich, dewy sheen. The packaging is both sleek and functional including a side mirror and push-button LED light for convenient application, even in the dark. both formulas will change the way you think and feel about gloss. Envision satin-smooth gloss in the most en vogue shades gliding effortlessly over your lips while depositing ingredients such as Dragon’s Blood and pure Lanolin known for nourishing, hydrating, conditioning and healing. Finally, a gloss that leaves your lips feeling luxuriously soft and supple…even the day after you’ve worn it. What I think: I love these glosses! They are insanely moisturizing and give a really good color payoff. Plus the light and mirror help with flawless application in the dark. 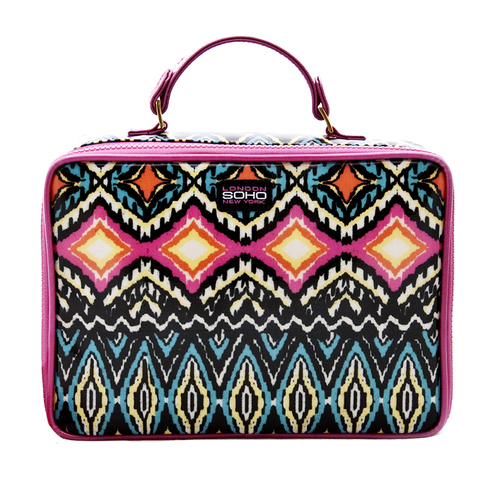 London SOHO New York Love Fest Weekender ($29.99 USD) — Haul your essentials in fest-friendly neon tribal print bags. This single zip weekender opens to reveal a makeup brush holder, plus a large mesh zip compartment that’s perfect for holding everything in while being able to view its contents. The single top strap makes for easy toting. Made of easy-wipe coated canvas. What I think: This bag is so cute! And, it is so important to have a bag that will keep toiletries organized on trips. This holds a lot and looks stylish while doing it! Sebamed Paraben-Free Scalp Activating Shampoo ($15.49 USD) — Helps fight hairloss by supporting natural scalp circulation, which is essential for hair growth and thicker-looking hair. NHE complex, derived from vitamin B3 combined with caffeine, promotes scalp blood flow. Gingko biloba, the natural extract of Asian gingko tree, nourishes and strengthens the hair follicles. Independent clinical testing show 90% of users report good to excellent effects on hair density and hair growth within 6 months. Sebamed Paraben-Free Moisturizing Body Lotion 1000 ml with Pump ($45.99 USD) — New Formula, New Look, Same great quality! Dermatologist developed, this nourishing, non-irritating formula is suitable for the most sensitive of skins. Rapidly absorbed and non-greasy, it restores your skin’s moisture balance, providing natural protection from the elements. Enriched with chamomile extract and allantoin to soothe and moisturize. Regular use tones the natural elasticity of your skin for a more youthful, healthy appearance. What I think: The shampoo is really nice to use a few times a week. I have noticed hair growth yet, but I like how it makes my scalp feel clean and my hair so soft. The Body Lotion works so well on sensitive skin and hydrates very well. I like using it after the shower because it locks in moisture. Next postLa Bella Review and Product Giveaway!